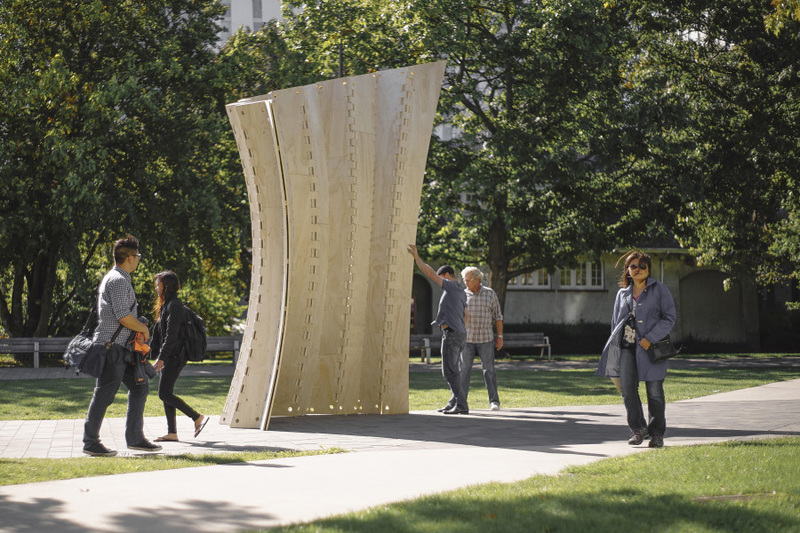 Taking place at the Centre for Advanced Wood Processing, University of British Columbia, and led by research associates David Correa and Oliver David Krieg of the Institute for Computational Design (ICD); the workshop explored elastic bending of large scale timber sheets for double-layered timber structures through a combined approach of material oriented design and robotic fabrication techniques. 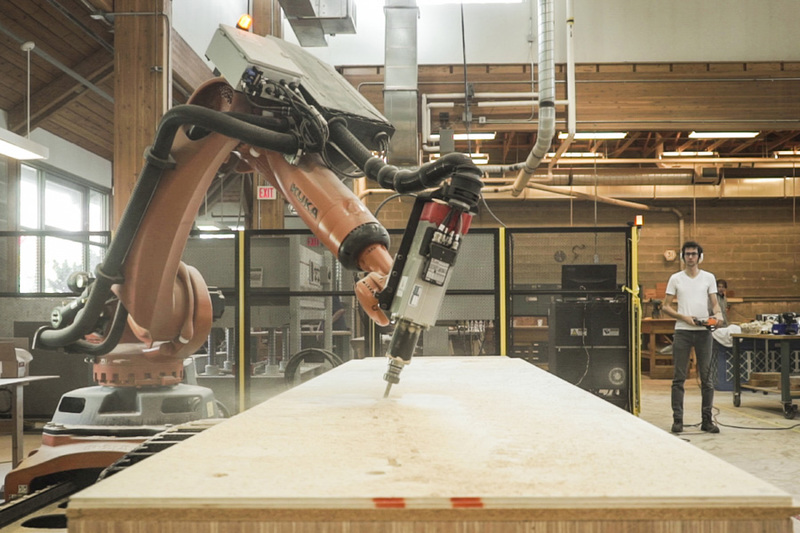 While many industries have made leaps and bounds in adopting highly flexible and fully automated fabrication workflows using robotics, the construction and design industry are only just starting to open the door to these technologies. 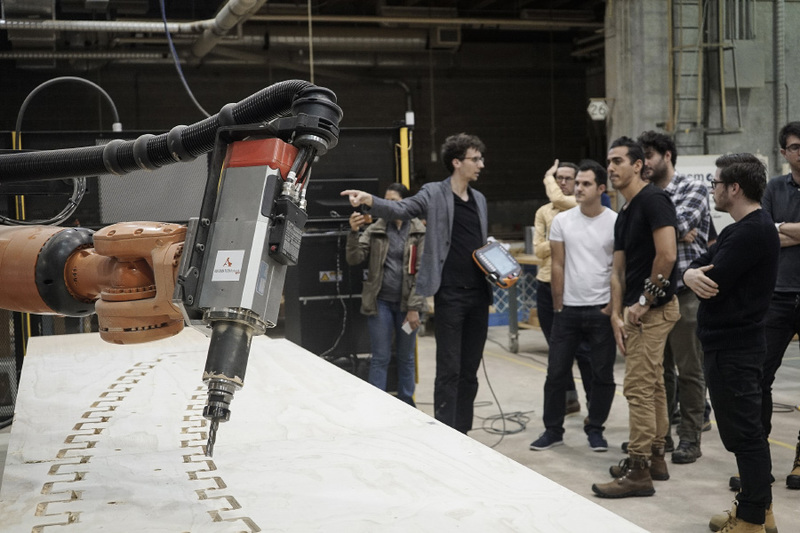 Recent developments in robotics combined with more accessible design-to-fabrication tools can now offer architects, designers and fabricators unprecedented access to a new design paradigm. 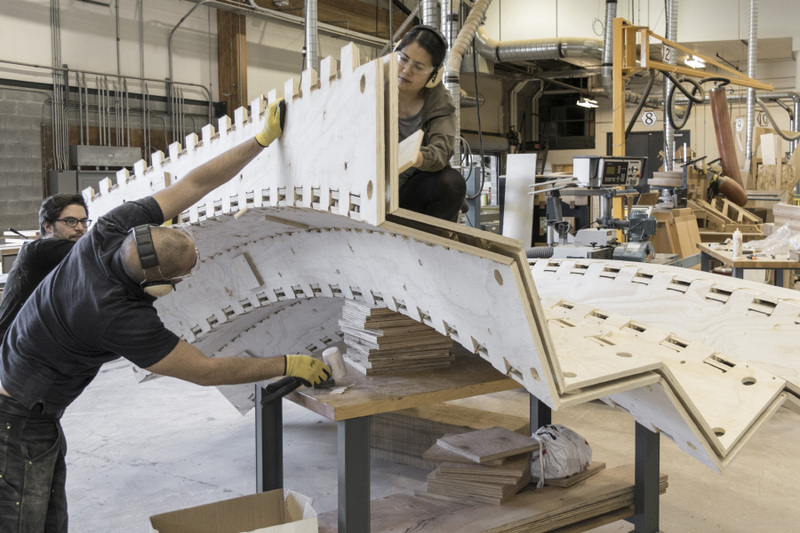 Advanced timber fabrication techniques, state of the art computational tools, and material-oriented design strategies are incorporated in the workshop to take advantage of the extended fabrication range of the multi-axis set up to create a unique large-scale material assembly system. 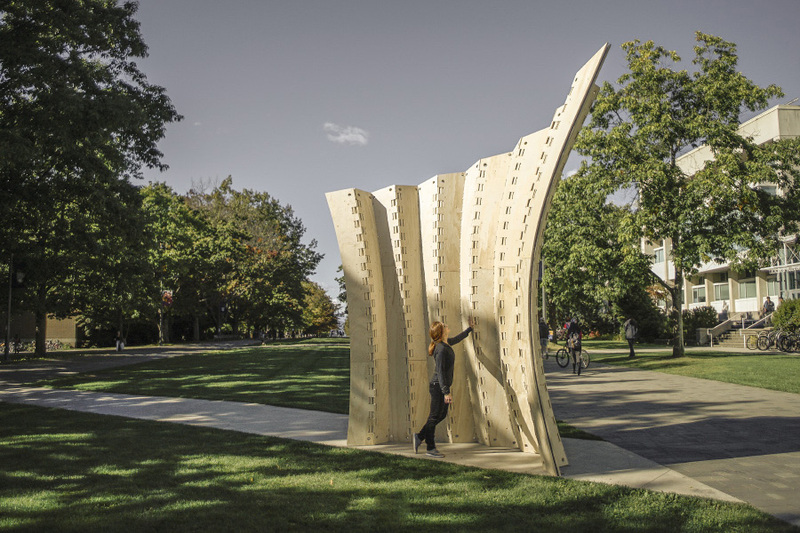 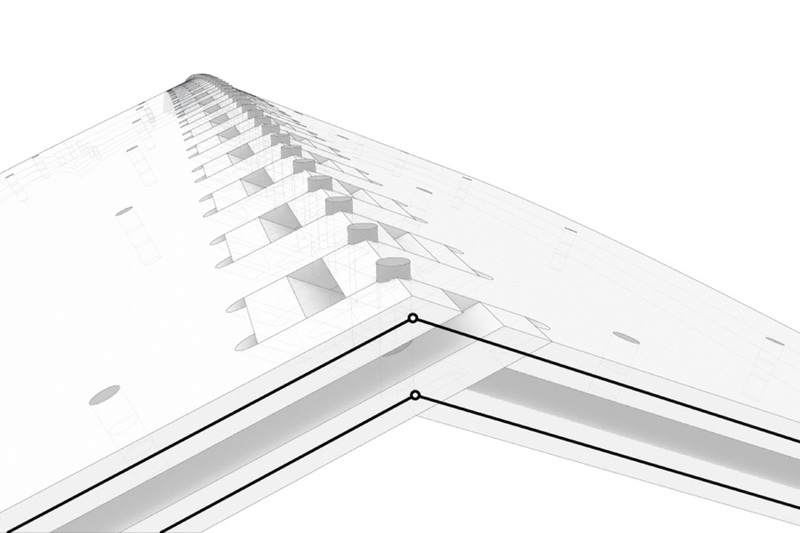 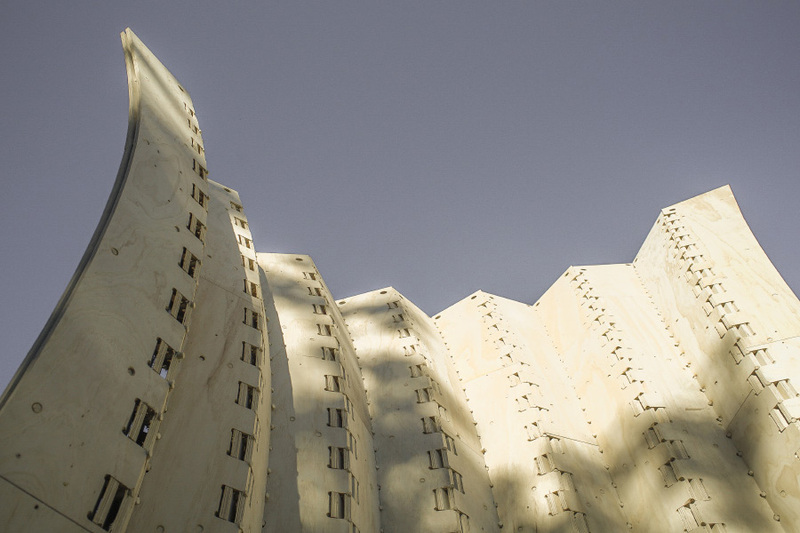 Elastically bent plywood sheets form double layer panels that are interconnected using finger joints with hygroscopically actuated fasteners informing the final geometry during assembly. 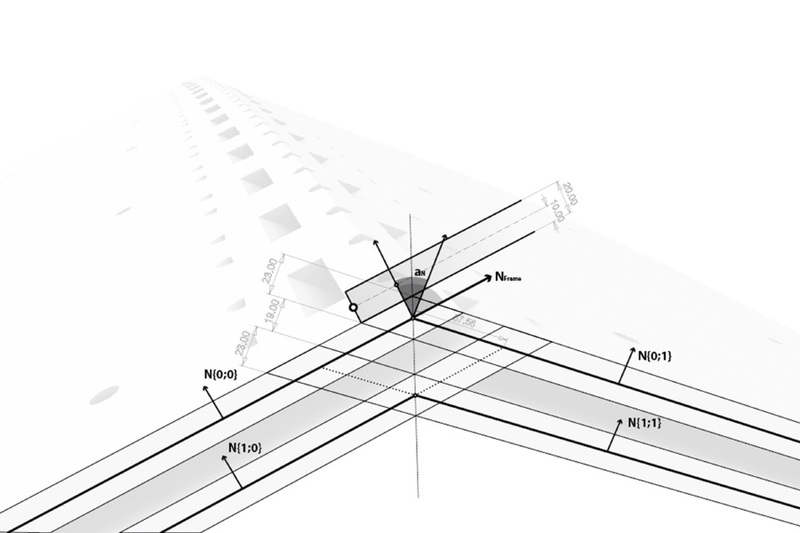 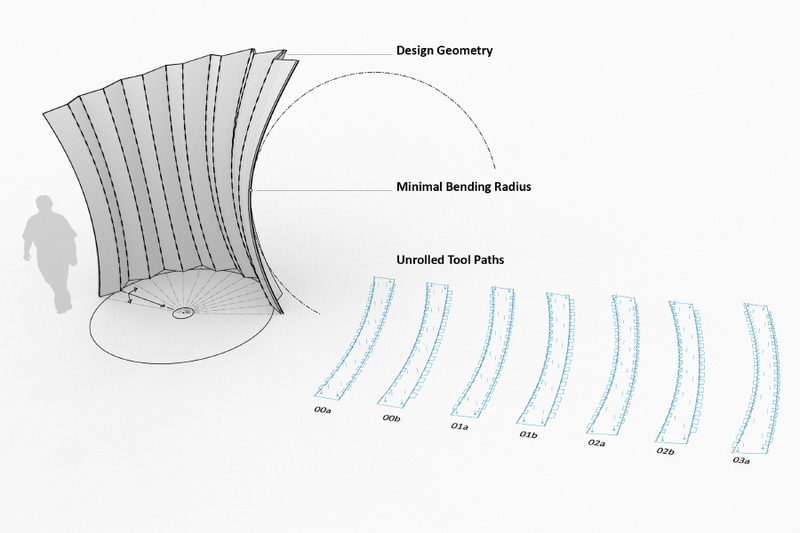 Employing the concept of design to fabrication as a feedback loop, the bending radius for each sheet and panel is defined by a computational design tool that exports the fabrication data directly to the robot. 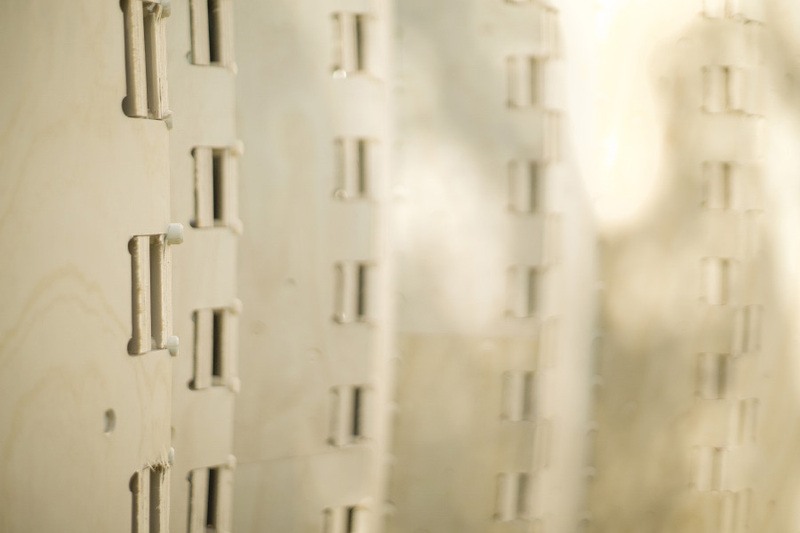 The coupling of elastic bending and hygroscopic expansion allows for the complete assembly of the self standing structure without the need for any metal fasteners or molds. 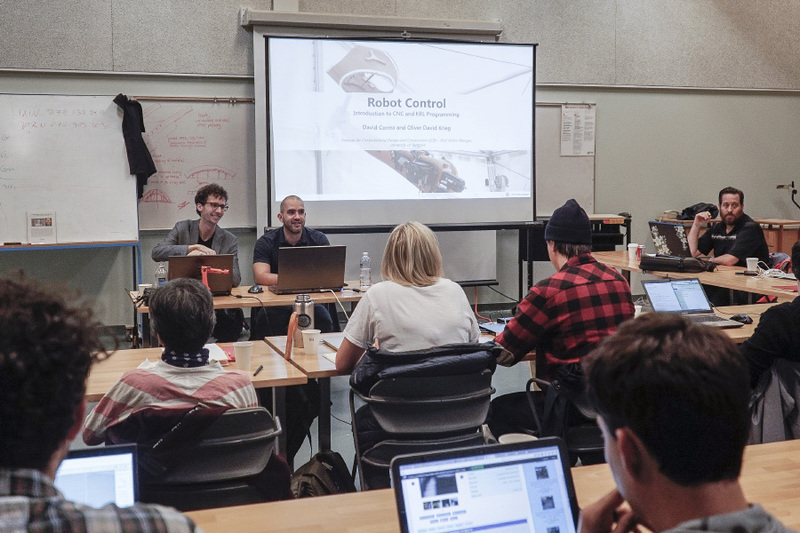 Using an eight-axis industrial robot configuration, the participants were guided through the unique technical and conceptual foundations that underpin robotic milling in wood through the development and construction of a full-scale assembly. 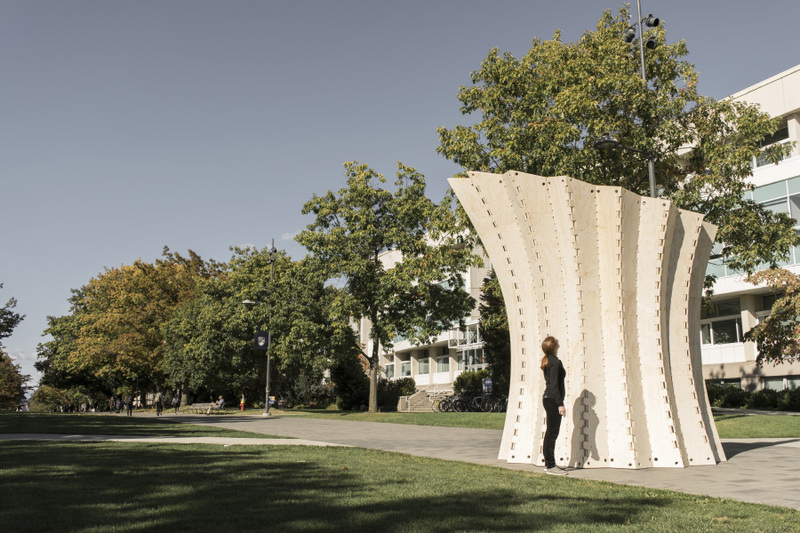 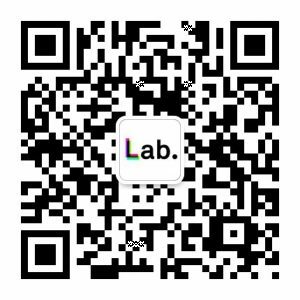 Taking a double-curved design surface as an input, the tool generates a buildable structure within the material and machine constraints. 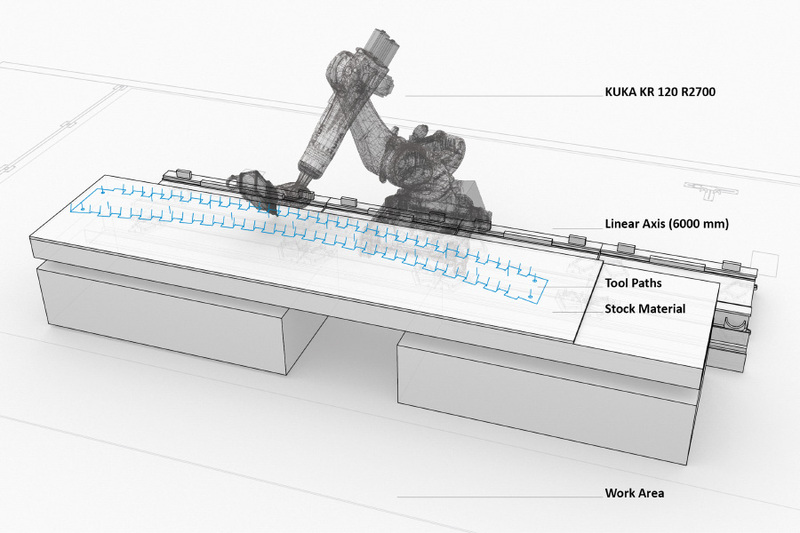 A simulation of the robotic milling process and export of robot control files are fully integrated in the computational design process. 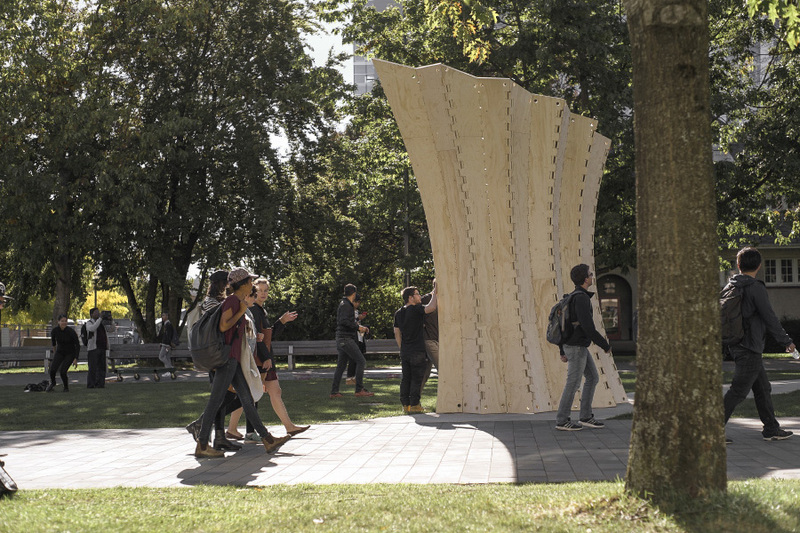 It allowed to form a digital loop between design and fabrication leading not only to innovation in timber construction, but also for a re-interpretation of wood architecture.